SEATTLE – Elizabeth Williams and Layshia Clarendon of the Atlanta Dream had a plan for their All-Star break. Clarendon bought Williams a model rocket – “because I’m a nerd and I like that science stuff,” Williams said – and they were going to find a local park and go launch it. And then the WNBA called. “Obviously, it’s a good reason not to have a break,” Clarendon said. 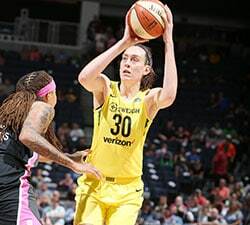 Ten players will take the floor for their first-ever WNBA All-Star game on Saturday at Seattle’s Key Arena – two of them for the veteran-laden West team and eight for the upstart East team. 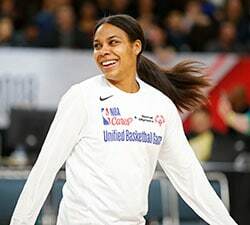 Clarendon laughed about the fact that her and Connecticut’s Jasmine Thomas were feeling very competitive during the shooting contest at Friday’s public practice session. Williams said Sue Bird gave her good advice about finding a “happy balance”. Clarendon tweeted on Friday from the bus on the way to practice that she was getting emotional about this experience because she knows it was the result of a lot of hard work. Her fellow newbies feel the same way. Williams said the energy is rubbing off on the veteran players. “I think they are kind of reminded about how they felt the first time they were here,” Williams said. Connecticut’s Jonquel Jones, one of three first-time All-Stars from the Sun, was dancing after practice, laughing with her East teammates, taking pictures. But she isn’t going to miss the opportunity to glean some knowledge from one of her idols. “Tina Charles is someone I’ve looked up to for a long time, so I’m going to pick her brain,” Jones said. Chelsea Gray is one of the two first-year All-Stars on the West team, along with Seattle’s Breanna Stewart. 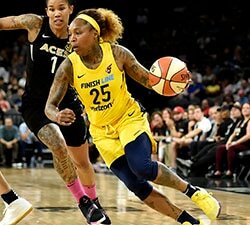 Gray was a contributor off the bench last year for the Sparks in their championship run before becoming the team’s starting point guard this season. Gray acknowledged she doesn’t know what she doesn’t know about this experience. Connecticut’s Alyssa Thomas is excited to be here with her Sun teammates, considering they are one of the hottest teams in the league. Stewart spent much of Friday with a video camera strapped to her chest, recording her first-hand experience as an All-Star. When the West team gathered at half-court to start practice, the “rookies” were supposed to dance off. Gray showed off her moves. And Stewart just shook her head. Didn’t want to jostle that camera too much, clearly. But Stewart is ready for a celebration of the best talent in the WNBA on the Storm’s home floor. Diana Taurasi remembers her first All-Star game experience. 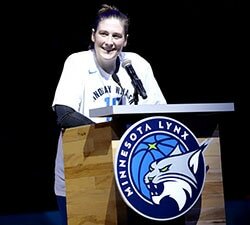 She sat down in the locker room between Lisa Leslie and Sheryl Swoopes. Everything else after that is pretty much a blank.